The Story of an Amazing Tree of Life Contents Introduction Vitamin Mineral Content of Moringa Amino Acid Content of Moringa The Moringa. Moringa [Ben/Behen], is known as the miracle tree – and with good reason. It grows to a height of only 7 – 12 m and has a lifespan of a mere 20 years. Though not as impressive in stature or longevity as the beloved baobab, it can more than hold its own in the impressive stakes. Moringa has a short, but intense life, growing like the clappers. It can grow up to 4 m in in a season – taking a mere 10 months from seed to tree! As the maxim goes ‘Dynamite comes in small packets’ – and the mighty moringa sure validates this claim, and then some. Powdered leaves to add to soups, stews, juices and smoothies. Tea for making herbal infusions. Capsules for taking internally as a supplement. High quality oil for massage and manufacture. Moringa grows in over 80 countries, is known by over 200 different common names, and is referenced in over 300 folk medicine remedies. 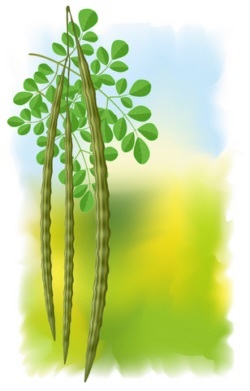 Also known as the Drumstick Tree, and Famine Tree, Moringa’s virtues have even been passionately extolled by Dr Oz on TV, and lauded in print in the National Geographic [Nov 2012] magazine. Moringa is one of the most ancient oils known to humans and its healing properties, which have been documented by ancient cultures [Greeks, Romans, Egyptians], have stood the test of time – and still come out with flying colours to this day. All parts of this revered tree, native to Africa and India, are used for their pharmacological and nutritional properties, hence the ‘Miracle tree’ appellation. Moringa’s leaves and seeds are full of health-giving nutrients and skin-loving fatty acids. It is used in cooking, cosmetics, medicine and lubrication – and even has potential as a biofuel. Along with the other unique African oils, Moringa has become the latest darling of the natural and commercial cosmetic industries, due to its remarkable skin-smoothing, radiance-boosting, decongesting, detoxifying, moisturising, conditioning and anti-ageing properties. 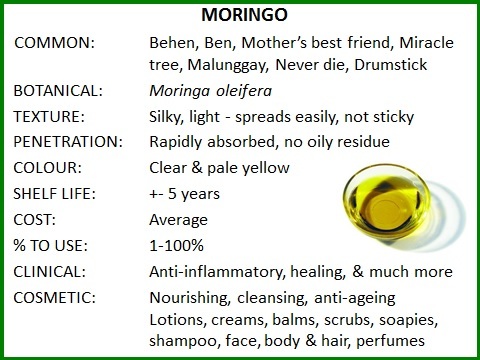 Besides its many other virtues, Moringa oil possesses exceptional oxidative stability, which may explain why the Egyptians placed vases of this oil in their tombs to assist them in the afterlife – so chance is a good thing that Cleopatra knew all about this facet of Moringa’s impressive profile! 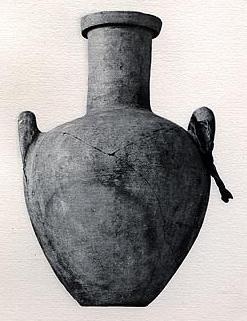 Here is a picture of the Moringa Amphora from the Tomb of Maiherpri * [his name can be translated as Lion of the Battlefield]. Some of the dockets attached to the jars indicated that they had contained b3k-oil, a very expensive commodity made from Moringa nuts. * Maiherpri was an Ancient Egyptian noble of Nubian origin buried in the Valley of the Kings, in tomb KV36. He probably lived during the rule of Thutmose IV, [the 8th Pharoah of the 18th dynasty of Egypt, who ruled in approximately the 14th century BC. Did you know that Moringa oil was used for perfumery long before the advent of alcohol distillation and other modern day diluent chemicals? Distillation dates back to more or less the 4th century BC. During these times aromatics were extracted by steeping plant material or splinters of fragrant wood in oil to extract the essential oils. The macerated material would eventually be placed in cloth and wrung out until the last vestiges of aroma had been retrieved. Alternatively the material was boiled with oil and water and the aromatic essential oil skimmed off. Besides Moringa, other oils like balanos [from the seeds of the Balanites aegyptiaca tree], castor, linseed, olive, sesame, safflower and sometimes almond were used. 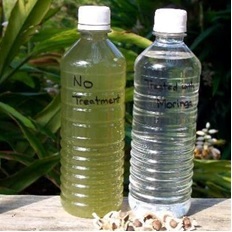 Traditional perfumers however held [and hold] Moringa oil in esteem for its exceptional fixative powers i.e. it can absorb and retain even the most elusive scents, locking the aromatic molecules into the oil. Another one of the reasons for my enduring love affair with this divine oil. There are reports of Moringa being used in cosmetic preparations as far back as 1400 BC, wherein an allegedly successful remedy to treat wrinkles consisted of: gum of frankincense wax; fresh Moringa oil and Cyprus grass [Cyperus alternifolius] – a grass-like marsh plant of the Cyperaceae [or sour grasses] family that is also used to make papyrus. The mixture was ground finely, mixed with fermented plant juice, and applied daily. Let me know if you try it and it works! These days Moringa seed oil is in much demand for natural and luxury cosmetics because of its stability profile and resistance to rancidity, which is due to high levels of powerful antioxidants. Native to the Himalayan Mountains, Moringa oleifera is nature’s “miracle tree”. It’s packed with 90+ verifiable, cell-ready vitamins, minerals, vital proteins, antioxidants, omega oils, and other benefits.